We grow green beans in our garden every year and from that harvest we have fresh green beans for recipes, then we preserve some the beans for use during the winter months. Fresh Green Beans With Apple Dressing is a recipe that we developed this year and we have really enjoyed it. The fresh green beans are covered with a fresh apple dressing that has a fabulous flavor. I have shared this dish at pot lucks and with dinner guest, it has been a big hit and sure hope you enjoy it! Wash and snap the green beans. Place the green beans in a stew pot and cover them with water. Bring the beans to a boil, reduce the heat to low and cook for 20 minutes. Drain the green beans and place them in ice cold water to stop the cooking process. In a hot skillet, add the bite size bacon and cook it until it is brown. Add the apples and cook until tender. Mix the vinegar,brown sugar and water until the sugar is dissolved. Pour the vinaigrette over the bacon and apple mix. Drain the green beans and place them in the serving bowl, pour the Apple Dressing over the green beans and gently toss together. This Fresh Green Beans With Apple Dressing recipe is a great side dish for very special dinners or a great get together with friends. Thanks so much for stopping by today and sharing some of your time with us, it is always great to visit with you. Hope you have a fantastic week and come back to see us real soon! That looks so good! I tend to fix my fresh green beans only a couple of ways, I could really use to mix up the routine. I need to give these a go! I always enjoy finding a new way to serve vegetables. This looks interesting and delicious. Thanks for sharing it. I never would have thought about putting apples with green beans, but it looks and sounds delicious! Thanks for sharing on the What's for Dinner link up! 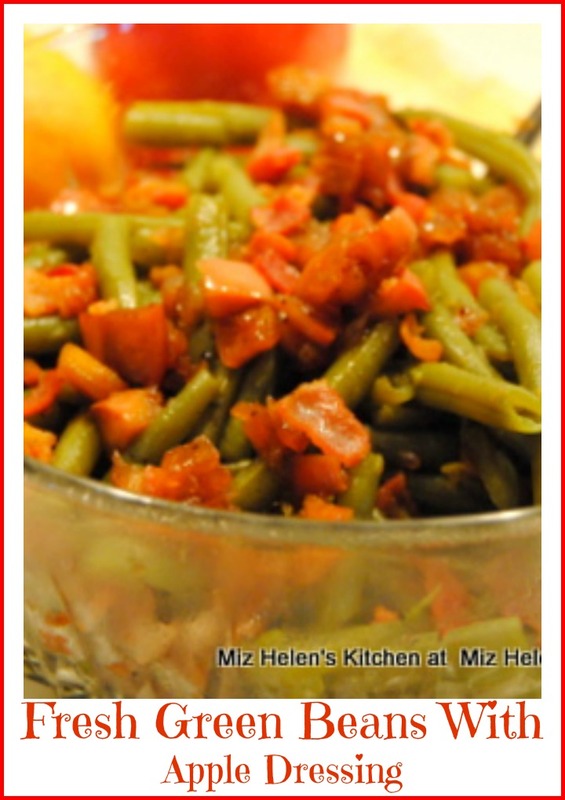 I love the sweet/savory flavor combination you have going on with these lovely Fresh Green Beans with Apple Dressing, Miz Helen! What a lovely Thanksgiving side dish. Shared on our Hearth and Soul Facebook page. Happy Thanksgiving!